12 volt electrically operated car radio aerial. This aerial is supplied with TWELVE different fitting kits to enable replacement of most factory fitted aerials at a fraction of the normal dealers price. 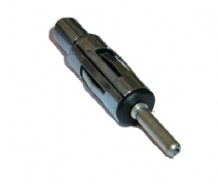 High quality clutch and limiter switch. Please contact us if you have any questions concerning this product. The wiring is extremely simple with only four connections to make, The aerial signal cable itself & then one cable to negative, one to a permanent live and the last to a live when either the radio is turned on OR when the ignition is enabled. Spec:- Clearance under the wing = 330 mm. 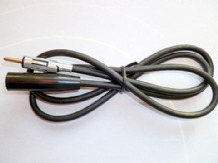 The antenna signal cable is 1390mm in length and terminated with a conventional car aerial plug. Suitable for most VW / Audi vehicles. Professional quality car radio aerial connection converter. Converts from the circular DIN type connector to a socket to accept a conventional DIN male aerial plug. Converts from the circular ISO type connector to a socket to accept a conventional DIN male aerial plug.